Captain Fred's Boat Tips- Is it Fact or Fiction? I frequently have the pleasure of meeting many of my readers, and enjoy their comments while out on my charter boat Miss Port Austin. A question often asked is, “How do you get your ideas?” Another is, “Are the stories fact or fiction?” and “Did that really happen?” Well here is a story that will draw lots of discussion and like all the others; it describes a true incident that occurred a few years ago. I had been fishing near the Port Austin lighthouse and observed a large cruiser heading for the dangerous reef the lighthouse is intended to warn boaters of. I immediately picked up my radio and attempted to call the boater to alert him of the hazard but my calls went unanswered. The vessel continued toward the reef turning only slightly north when he noted the breakers on the rocks. Joined by fisherman aboard my boat we waved and tried to signal the vessel as it approached the dangerous area. The captain waved back as the cruiser sped by within a few feet of the lighthouse. Of the four antennas on his bridge one had to be for a marine radio, but he failed to turn it on. The fortunate skipper apparently skimmed over the rocks without damage and he continued on a southwesterly course. The morning’s charter was concluded so I had my customers bring in their lines, and I hauled the anchor. As we began making our way toward the harbor, I noticed a cruiser off in the distance come to a quick stop. At the same time, there was a frantic MayDay call to the Coast Guard. The caller stated he had hit something and was taking on water faster than his pumps could expel it. He was sure his vessel would sink. He also said he had been on a course to Port Austin’s harbor. The cruiser I observed was in dangerous water on a course toward Port Austin, so I was certain it was the one calling MayDay. I directed my course to intersect his thinking we might be able to assist by providing life jackets or a life boat should the vessel go down. Assured the vessel in sight was the boat in trouble; I tried to hail him on the radio. The vessel taking on water answered just as the cruiser I had been observing crossed my bow. It became evident there were two different boats. The one I had been watching was not the vessel in trouble but perhaps could have been. The MayDay calls from the sinking vessel reported he thought he was in about 40 feet of water and there were 9 persons on board. Upon hearing this transmission, I immediately called my office and instructed them to have one of my crew load extra pumps in the towboat and prepare to get underway as soon as I reached the harbor. I also requested the sheriff’s marine officers be notified I would assist. The Coast Guard relayed they were getting vessels underway from two different directions and a helicopter had been dispatched from their air station. With all the resources headed toward the sinking vessel, I was sure we would be able to save the lives of those aboard. The position given by the paniced boater was not an exact location but, with five different craft approaching from different directions, we likely would reach it in time. The sheriff’s boat was the first out of our harbor followed by Harbor Beach Coast Guard’s 25-foot trailored boat. Since I had to dock my charter boat and get aboard my towboat, I was the last to get underway from Port Austin. I heard radio communications from the Tawas Coast Guard 47 footer as they came across the bay. The helicopter was now overhead and in contact with all resources. The Sheriff’s boat had gone to the last position given by the sinking boat but found no sign of the vessel or its occupants. The helo was the first to spot it as all five responding resources reached the area at the same time. The cruiser, a 34 footer was resting safely on a sandbar about 100 feet from shore 2 miles from the position it had last reported. A fisherman who had been fishing nearby in a small boat had heard the frantic calls for help from the cruiser. 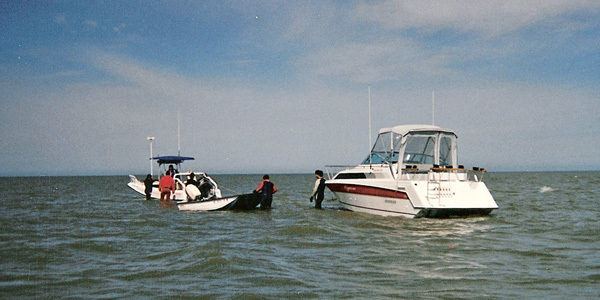 He was somehow able to tow the boat onto the sandbar thus preventing it from sinking. He relayed that there were only 2 persons aboard, not the 9 reported, and they were both safe. None of the resource craft could reach the boat in such shallow water so it was necessary to send my crewmen out from shore. They put the two people in their life raft that was floating behind the damaged boat than pulled it ashore. The damaged vessel was pumped out and holes were plugged. When it was secured, we towed it to Port Austin’s harbor for repairs. Stranger incidents have happened and will continue to happen giving me the opportunity to write columns that make readers wonder “Is that Fact or Fiction”.